On this tenth day of the Postcard Advent Calendar I share a card sent by Helen Stephenson Minor to her 7 year old brother, Donald Corbly Minor. At first glance I was struck by the resemblance of the child to Thomas Gainsborough’s portrait of The Blue Boy, 1770. 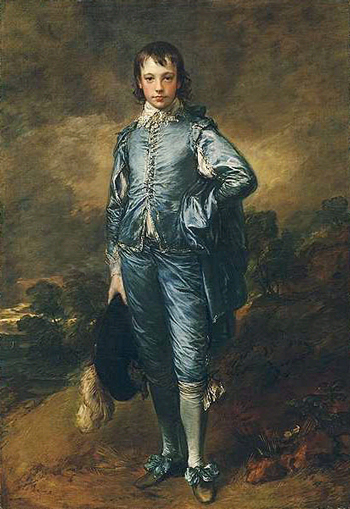 Note the similarities in the Victorian illustration and the Gainsborough painting; in each a boy is depicted wearing a blue suit, edged with lace, and paired with white stockings and knickers. A hat is festooned with feathers and the shoes tied with ribbons. The object of each child’s concentration differs, but the position of the legs is identical.The costume predates The Blue Boy by about 130 years, leading many art experts to wonder if Gainsborough created this painting as a tribute to the great master painter Van Dyke. How are you getting along at school by this time? I am just ready to go to class. What do you want for Xmas? Tell mamma and papa I will write a letter soon. Have you had Billy hitched to the sleigh yet and how does he go? How much vacation do you have Christmas? Is there anything going on down there Xmas. With love to all from Helen. Ditto, Helen. With love to all–Best Christmas Wishes! 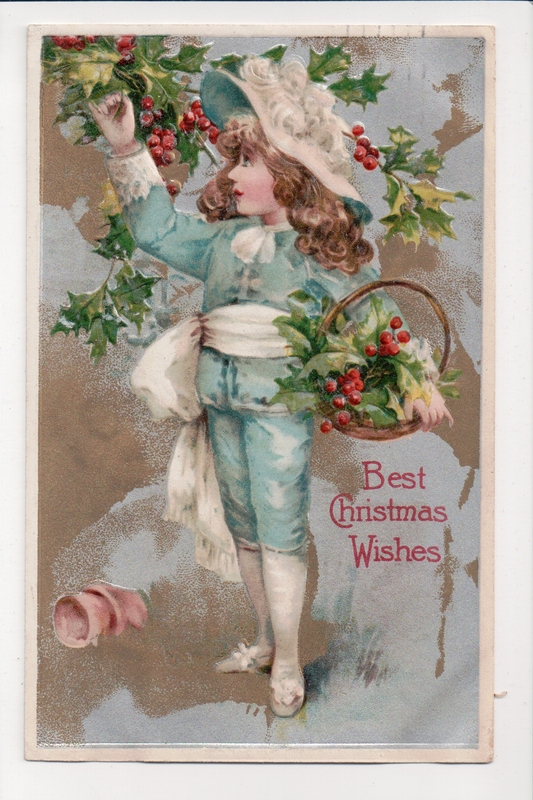 Previous Article Postcard Advent Calendar, December 22: My Fair Lady Wishes You A Happy Christmas! Next Article Postcard Advent Calendar, December 24: Sing A Song for Christmas!